The statement references the "so-called Libya mode of nuclear abandonment" on more than one occasion, saying US comments about complete denuclearization amount to "a manifestation of awfully sinister move to impose on our dignified state the destiny of Libya or Iraq which had been collapsed due to yielding the whole of their countries to big powers. ... It is absolutely absurd to dare compare [North Korea], a nuclear weapon state, to Libya which had been at the initial state of nuclear development." Clever tactics or Kim's indecisiveness? Well, let's look at what we know. 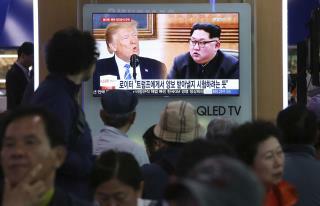 The Kim Dynasty has sequestered North Korea and prevented his people the benefit of evolving into a nation among nations in trade, politics and advancement. Kim Jong-un has perpetuated the KD policies and escalated belligerence, isolation and insecurity by pursuing not a nuclear defense but a blatantly offensive nuclear arsenal. Kim's rhetoric has been vitriolic and provocative and his propaganda claiming that NoKo is under attack by the U.S. is clearly meant to deceive and manipulate his people. The net result of his actions have yielded no advantage for NoKo and even the pending talks are a remediation of Kim Dynasty mistakes. So, quashing the pending peace talks after demonstrating his own acknowledgement of the only reasonable path forward for NoKo, Kim clearly doesn't know WTF to do. Does that sound clever to you? Little Peace Prize Man had better be careful or he will be met with wine and roses.